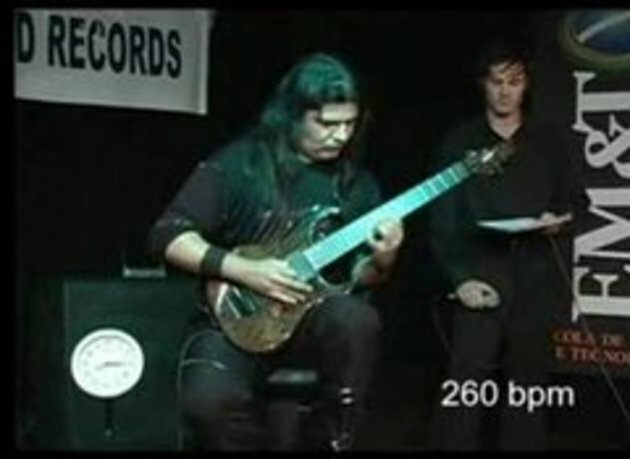 The world record of guitar speed playing. The counter in the bottom right corner shows the amount of Beats Per Minute. his left hand reminds me of a printer head. yikes, that left hand is vibrating at 5 times a sec!! I bet his girlfriend loves him VERY much ! I wonder if he has ever considered mating with a hummingbird? who cares. shredding sounds like crap. i think is in portugal or brazil cuz on the bottom right of screen u can read. "escola de ... tecno..."
It's Korsakov's "The Flight of the Bumble Bee".